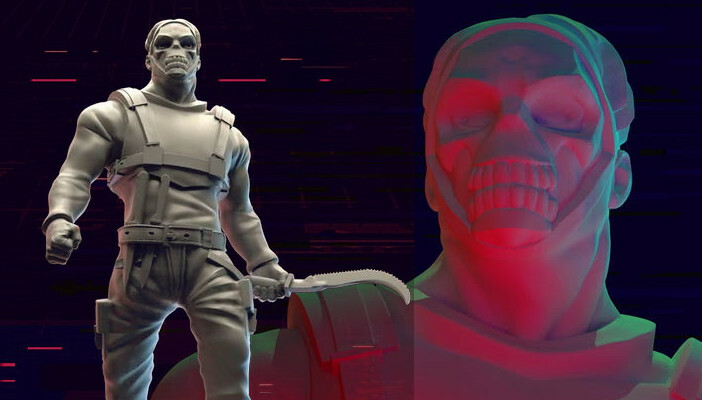 In an ever-changing maze of rooms, while avoiding the mysterious Killer, will you find a way the out or just make sure you’re the last one standing? 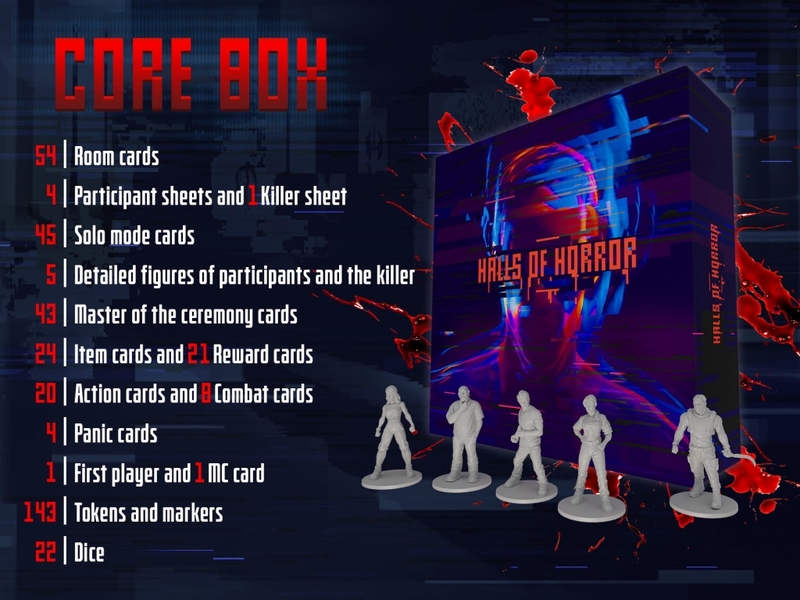 Halls of Horror is a competitive survival horror game with a modular board, secret action select and occasional asymmetrical gameplay. The goal of every player is to be the first player to gather 2 keys used to unlock the door barring their escape. All the while trying to survive against the other players and the Master of the Ceremony who directs the deadly Killer. On each player’s turn, they will select their action in secret and reveal simultaneously with the other players. It’s up to the players to explore the rooms to find weapons and items which will be essential for survival. Exploring is key because the main item players are looking for are 2 Keys which will unlock the Exit. However, if you’re not the searching type, you can also go the hunting route, since every participant has a key sewn into their body, thanks to the Master of Ceremony, the deadly game master who controls the labyrinth from afar. At the end of each turn, the First Player temporarily takes controls of the Master. In this phase, they gain the ability to directly influence the game board, such as closing off rooms or strategically dropping enticing gifts. They also can direct The Killer, a deadly beast of a man who is ruthless in his hunt of the hapless participants. Will you cull the weakest players or tackle the strongest? So chances are someone is going to kick the bucket during this trial. What then? In Halls of Horror, when a player dies, they may not get the chance of escape, but they can make sure no one else does either! 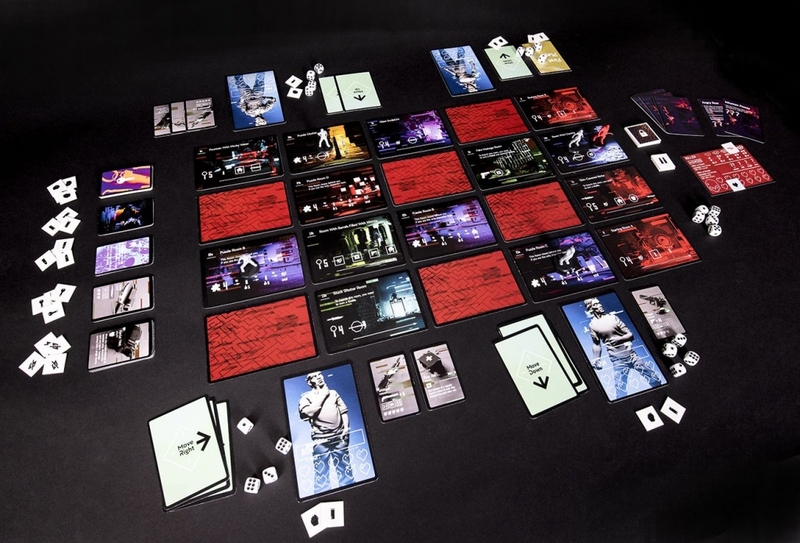 When a player died, they take over the role of Master of Ceremony and gain a wider selection of cards to choose from to better tune their strategy towards ending the lives of the other players. Also, with a more singular direction, the Killer becomes a much stronger threat. Be the first player to find 2 keys and reach the Exit to escape and win! Trapped inside a house built by the insane Master of the Ceremony, you are challenged to a deadly game in which the prize is your survival. Who will perish, and who will escape? Let’s find out! Explore, search, fight or flee, find the Exit, gain the Keys and escape… or remain in the Halls of Horror forever! 2-4 players can go head-to-head in their bid for survival, and you can also face the challenge alone in the game’s solo mode!